ERMS is an electronic system used for making referrals. A referral is when your doctor needs to arrange for you to see another health professional (such as a specialist, physiotherapist, or midwife). 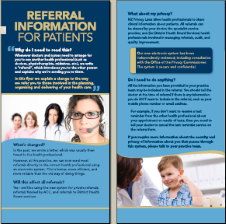 The referral introduces you to the other person and explains why your doctor is sending you to them. In the past, your doctor wrote a letter, which was either faxed to the health professional, or given to you to take to your appointment. ERMS allows your doctor to send most referrals directly to the correct health professional using an electronic system. This is a more efficient and more reliable way of doing things. Information on your electronic referral form is subject to New Zealand privacy laws and the Health Information Privacy Code. Is held in secure systems and networks. Is subject to data use and management policies. Will only be viewed by healthcare providers involved in providing your healthcare services. May be used for health services planning and clinical audit for public funded services. However, information that might identify anyone personally won't be shared in service planning reporting. For more information, download a copy of the ERMS flyer.